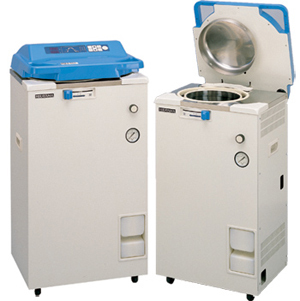 The Hirayama HVE-50 autoclave sterilizer is a self-contained, portable, top-loading autoclave with auto exhaust and warming cycles. The top loading feature with the lid opening upward is not only a great space-saving design benefit, it also means that this sterilizer is also desirable and particularly suited for the sterilizations of large fermenter vessels, so it is the perfect companion for fermenters like the Winpact fermenter. A dual-sensing lid interlock shut prevents lid from opening when chamber is pressurized or when temperature exceeds 97°C. The HVE-50 autoclave also features an agar melting mode for melting agar and maintaining it at liquid temperature. This also is convenient for hot, faster start-up. The autoclave has a convenient one-touch lever to easily open and close chamber lid. An in-process display shows the status and the progress of sterilization cycle. Door-closure sensor provides a prompt and the cycle will not start unless the door is closed properly. The Hirayama HVE-50 Autoclave Sterilizer is a self-contained, portable, top-loading autoclave with auto exhaust and warming cycles. HVE 50 HIRAYAMA DIGITAL AUTOCLAVE.Cap 50 LFitur :- Hemat-Ruang Desain Dengan Pembukaan Tutup Atas- Dual-Penginderaan Tutup Interlock Mencegah Pembukaan P44846. menyediakan teknologi terbaru Autoclave Sterilizer dari brand Hirayama, ModelHVE-50 dengan kapasitas volume 50 liter. Didesaian P234465. New and Economic Autoclave basedon Unique Features (type HVE-50)*Electromechanical lock system*Dual-sensing interlock mechanism*Pulse Exhaust System*Memory P393623.